Nike is one of the very big brands managing to cleverly connect to their customers through both very good marketing and a product range always catching and inspiring the trends. So they were very early to offer an iPod extension to connect their sport equipment with a lifestyle gadget. Since these early days of the Nike iPod marriage a lot has changed, but the basics are stil, you can listen to your favorite music and mange your training data. Nike+ offers a platform for managing the training data based on distance, pace and route and track performance over time. It also comes as an app for the iPhone including the GPS tracking. 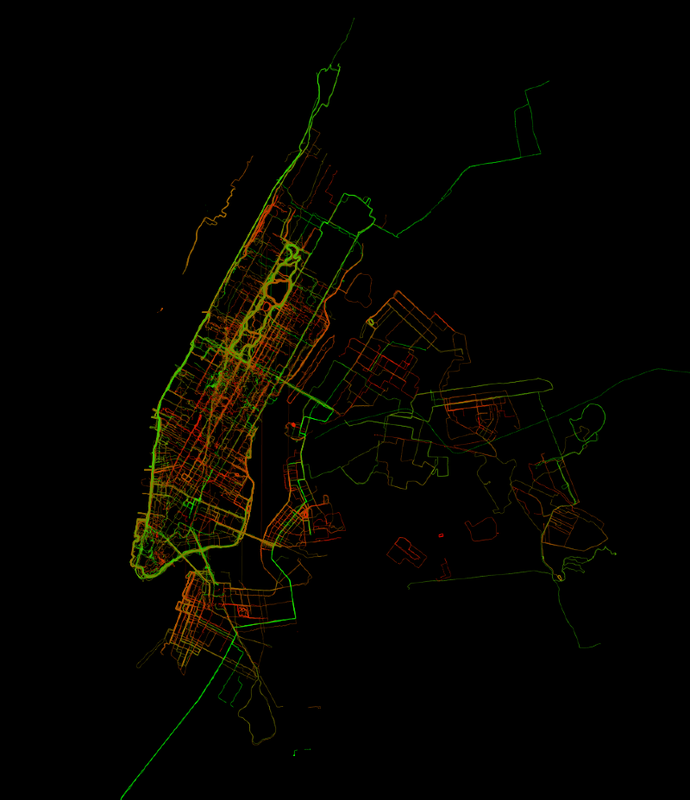 Image taken from cargoCollective / The 1000 runs of New York as a sample of Nike+ training data. The activity data redraws the geography of Manhattan including many of the streets. 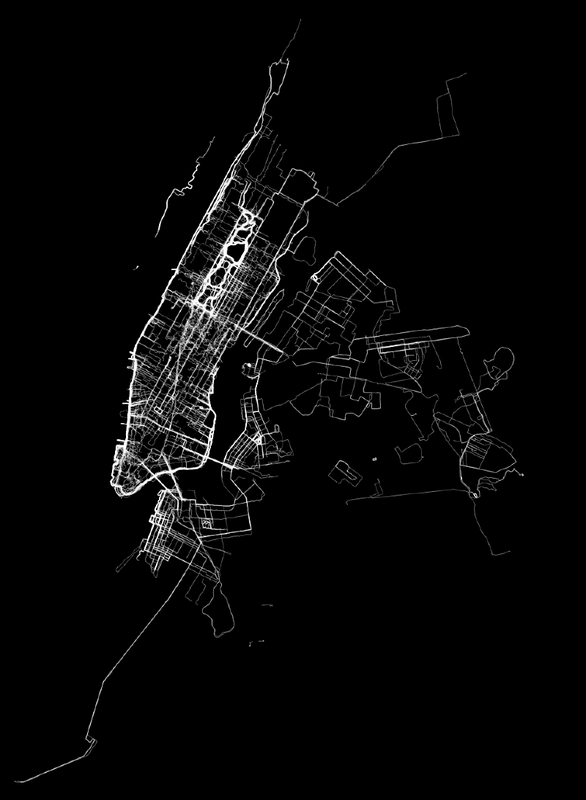 Cooper Smith, a interaction designer, worked with a 1000 runs taken from the Nike+ data store and produced a series of amazing graphics focusing on New York. What he is working with is really the GPS tracks and the contained time and location data. He has been using the Google Refine for data cleaning and processing for the visualisations. The data nicely draws out the geography of New York, especially Manhattan and shows a runners map of NY of sort. It is an individuals map with a collective presentation of spatial activity. Different patterns are showing as Smith is experimenting with different visualisation and processing parameters. Image taken from cargoCollective / Smith explains the distance parameters: “Not surprisingly, longer runs tended to be more prevalent in areas that runners could get to stretches of uninterrupted running trails, such as Central Park, the bridges, and the West Side Highway. Landlocked areas where trails are replaced by streets tended to see much shorter runs. I was surprised to see that most of the runs originating from the Upper East Side and Upper West Side were short runs, given their proximity to Central Park. It appears that people who begin their runs in Central Park tend to go for longer runs, while those who start outside of Central Park and run into it tend to go for shorter runs”. The full animation of the data shows the patterns over a 24 hour period, superimposing the tracks in time. There seems to be more activity after work, but already in the morning is quite a peak. Nevertheless NY seems to be running all day. At least this was the picture back in autumn 2010.